one really great feature about silverlight is the packaging aspect of it. what do i mean by this? well, you can essentially put a ton of assets into a compressed file and pull them out as needed. this would provide you the ability to have a single asset package that is compressed, and thus saving on some download time. of course there would be tradeoffs that you'd have to consider, but for sample sake, let's assume they are good. 17:          <Rectangle Stroke="#FF000000" RadiusX="4" RadiusY="4" x:Name="buttonPicture2"
25:          <TextBlock Width="57" Height="25" FontFamily="Calibri" FontSize="14" Text="Picture 2"
28:          <Rectangle Stroke="#FF000000" RadiusX="4" RadiusY="4" Width="118" Height="25"
36:          <TextBlock Width="57" Height="25" Canvas.Left="33" Canvas.Top="3" FontFamily="Calibri"
38:      <TextBlock x:Name="percentComplete" Width="110" Height="27" Canvas.Top="96"
notice the two events wired up on initDownloader and the two callback events that happen when those events are completed. take a look at the function onDownloadCompleted...this is where we leverage the compressed asset file. for this sample, we want to use images. 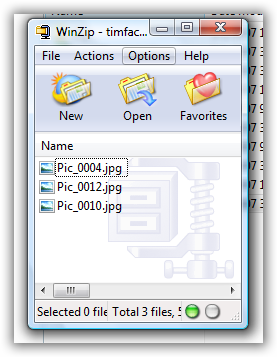 so basically we are setting an image object source to an item in the zip file. we first find the associated element, then setSource providing the name which resides in the zip file. that's it, we are done! then with that text i can do some createObjectFromXaml functions or something like that. pretty cool. have fun, check out silverlight today.